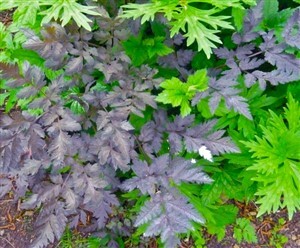 Anthriscus sylvestris 'Ravenswing' A Cow’s Parsley with finely divided, deep plum black leaves. Very attractive and highly desirable. Always much sought after as such a good foil for brighter subjects. The new leaves are bronze before aging plum. In summer pure white flowers shine above the foliage.